Dependent on the rating of at least 1.000 users, the 2.500 top and 2.500 flop movies listed in the Internet Movie Database (IMDb) can be explored. The (main) production country is used as the location for a movie, and the release year is used as the temporal value. Thus, quantities and qualities of film industries from different countries can be compared. UFO Sightings in the U.S. 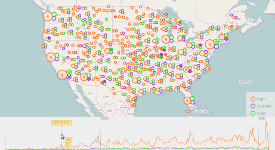 The database contains around 45,000 UFO sightings in the United States. 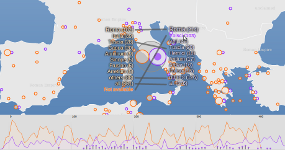 The incidents are dated from 1790 to 2010 and are sorted by shapes (e.g., oval, round, triangle, light). Try it out! 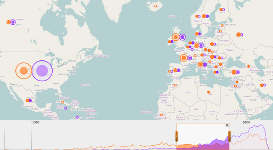 This dataset from the Google Ancient Places project lists places mentioned in historic books. The corresponding page numbers are used as the "temporal" value to be mapped onto the timeline. Thus, the user can analize and compare geographical referencing of different books to each other. This is a use case of the European project BioVeL. A comparison of two surveys for marine organisms in 1916-1938 and 2006-2009 at the south-eastern coast of Sweden reveals migrated as well as non-native species in specific regions by using the comparative placename (names of species are used as place labels) tag cloud. The Open Source database contains crime incidents by crime types (e.g., thefts, robberies, stolen cars, homicides) in Washington D.C. in 2009. Location and date as well as the neighborhood of each incident are given. The goal is to detect correlations between crime entries of different type. The Flickr Search API can be queried dynamically with requests for different tags (topics). The result sets contain thumbnails and links to public images matching the given queries. The place, where a photo was taken is used for geospatial and the time, when a photo was taken for temporal mapping. This Guardian dataset, which was originally derived from the popular Wikileaks Iraq War Logs data contains one entry for each incident during the Iraq conflict between 2004 and 2009, which caused at least one victim. You are able to explore all incidents or you can compare casualties by type to each other.